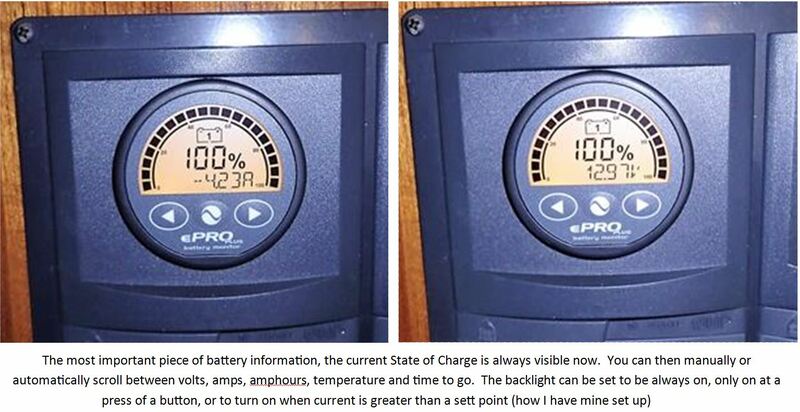 For as long as I’ve been involved in selling Independent Power Products which is now 21 years, battery monitors have been a very major part of the products within my repertoire. It started with the classic E-Meter, which later became the Link10 monitor – and these quickly became absolute essential products within all boating circles. Over the years, the technology has changed, but the same 52mm sized round gauge has remained and the customer benefits have continued to improve from those early models when they first came to the market – Without a doubt “they are the best window into the performance of your battery bank”. So why is a battery any different?? Run out of battery power, and bad things happen – fridges stop being cold and beers go warm, lights go out, tunes stop playing and sometimes, the Coast Guard gets called; what a terrible way to shatter any good mood. But the simple facts are that in many battery systems a decent battery monitor is the last thing considered, or a perceived luxury item never considered. Often viewed as ‘expensive’, very few consider that running a generator for hours on end burning unnecessary fuel because you simply ‘thought’ that the batteries needed a top up. With that in mind is a few hundred dollars on a battery monitor really a luxury if they can help reduce genset run times, wear & tear and maintenance (yes I did say REDUCE genset run times). But to save us all, we are going to describe it simply as ‘a fuel gauge for your batteries’ – don’t want to loose you all trying to explain a theory hundreds of years old, and to be honest – I don’t think even the so called experts understand the law fully either. So when I recently acquired an older generation Flybridge Cruiser, the very first thing I had to do (because I could) was upgrade all the electrical bits and pieces to Enerdrive gear. This meant to rip out the older generation battery charger and fit an ePOWER 60amp Smart Battery Charger in to recharge the house, start and generator batteries. 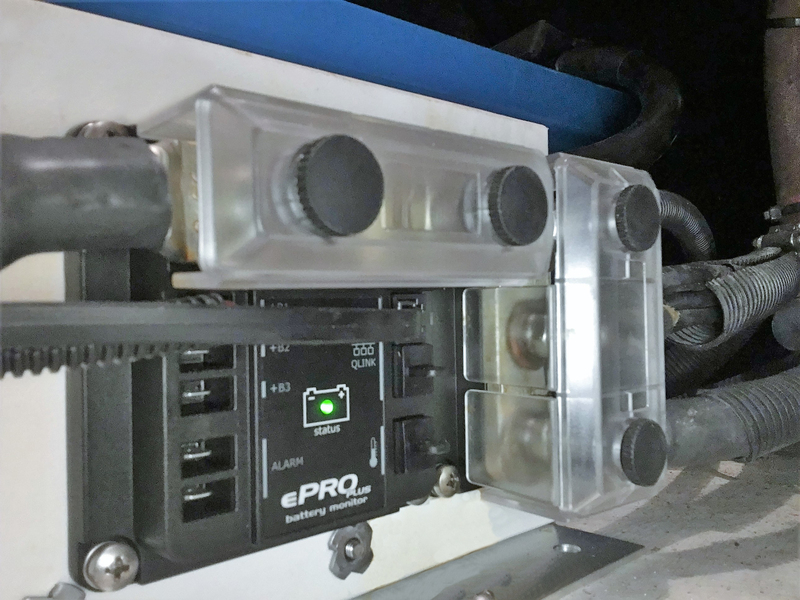 An inverter was a necessity, and the best choice was the ePOWER 2600w Inverter with AC transfer switch to keep the ice-maker running cold all day long, and the genset running as little as possible. Given that much of Enerdrive’s business these days is developing Lithium battery systems, I thought long and hard about what battery technology to fit for the house bank and ultimately I had to go by our mantra of selling Lithium systems – and that is you only recommend Lithium if you need to save space, weight and energy efficiency. Space and weight – hmm not a big difference for me in this 12 tonne boat, Efficiency – perhaps a bonus but most likely offset by the extreme heat of the engines located right next to the batteries. So it was back to AGM’s and good old FullRiver AGM batteries for the house bank, as well as new engine batteries all round just to be sure that any of the existing batteries weren’t nearing their end of life. 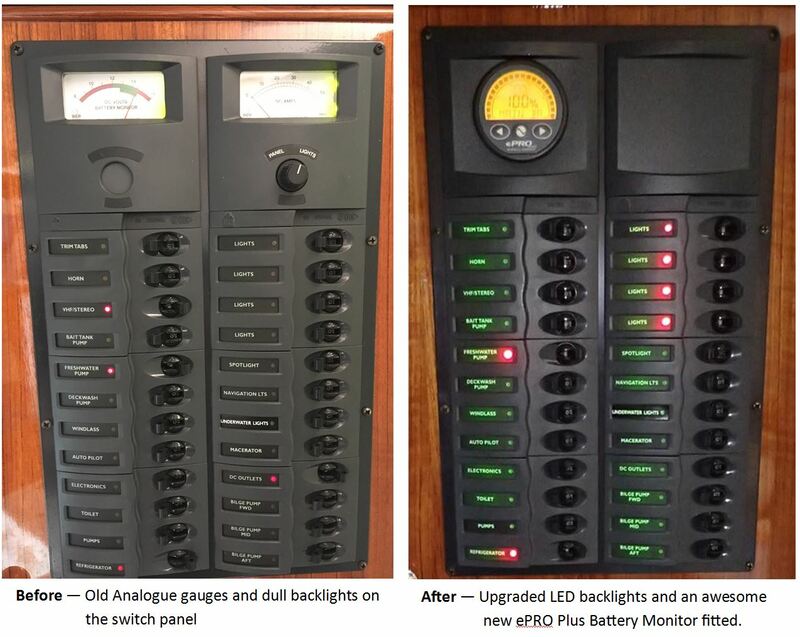 Then came the battery monitor and switch board, my long-time customer Warren Bruggy from C-Volt Marine Electrical helped rewire much of the boat and upgrade the older BEP switch panels with new LED indicators, and of course to make way for the new Enerdrive ePRO PLUS Battery Monitor. 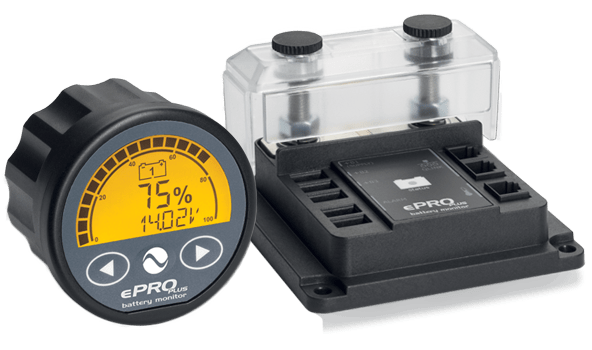 The new ePRO PLUS is a major improvement on past battery monitors. Past units had to use either multicore wire from the shunt (near the batteries) up to the head unit, or even RJ45 data cable carrying voltage which proved to be unreliable and inaccurate. 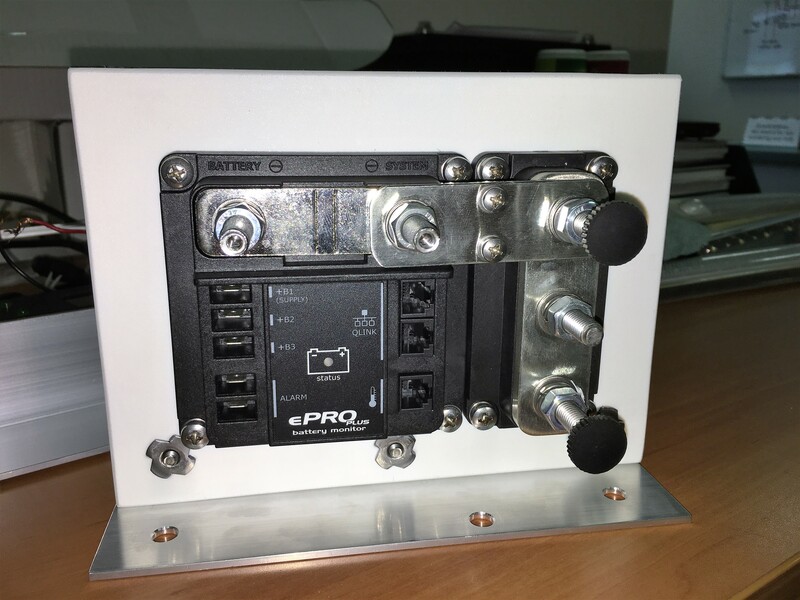 The new ePRO PLUS has all the brains, electrics and connections located right at the shunt, right next to the batteries. The only thing between the shunt and the display unit is RJ11 cable with very little chance of inaccuracy or installation error. The other great thing about having the electrics right next to the shunt is the ability to integrate other busbars right at the shunt to help spread out the cable connections to the negative post (we have seen past photos of shunts with only half a thread of turn used due to all the lugs). The new meter is a dream to install and Warren commented that it was the best battery monitor system he had ever fitted. So now that the ePRO Plus is fitted, what does it tell us? It’s basically everything we would want to know happening with the house battery bank – most importantly what the percentage state of charge is (just like that fuel gauge in your car). 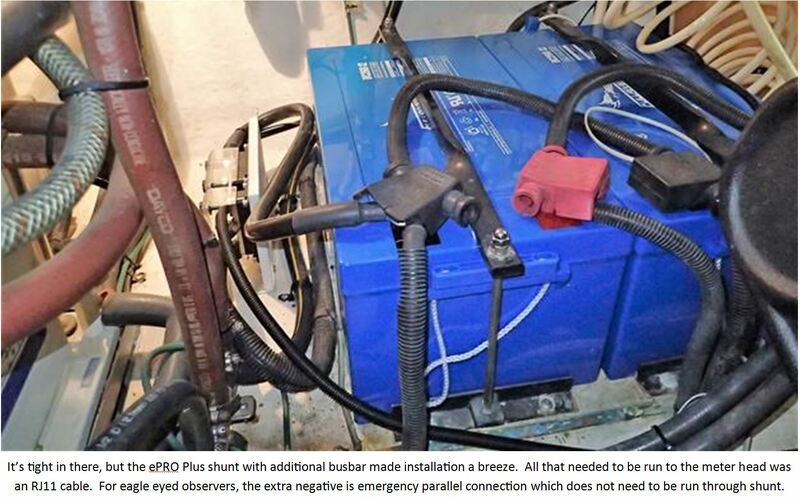 Remember the old rule of thumb not to let your AGM batteries get below 50% depth of discharge, so with the ePRO Plus you could set the internal alarm buzzer/light or even rig up your generator for an automatic start based upon reaching 50% depth of discharge (and you could keep the generator on automatically until you reach around 80% state of charge for maximum fuel economy).